Wang Xiangrong | People | HKUST Department of Physics "; myhtml += "
Professor Wang obtained his BA degree (1980) from Wuhan University and his ScM (1986) and PhD (1990) degrees from University of Rochester. He was awarded Minnesota Supercomputer Institute Fellow (1991) for post-doctoral studies at the University of Minnesota. 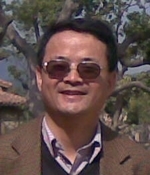 He joined the Physics Department of HKUST in 1992. Professor Wang is interested in revealing the physics principles behind the novel physics phenomena in condensed matter physics. Currently, he is working on the interplay of charges, spins, and phonons in interesting materials and devices. One particular question is how the interactions of charge, spin, and phonons affect the spin dynamics and electron transport. The current research topics include magnetic domain wall motion under electric and magnetic fields, thermal gradient, and spin current of electrons and magnons; domain wall pinning theory; theories for large magnetoresistance in nonmagnetic systems; and electronic properties of novel systems. Nano-magnetism and spintronics: magnetization dynamics and magnonics; Quantum phase transition of disordered systems. “Instability of Walker Propagating Domain Wall in Magnetic Nanowires”, B. Hu and X. R. Wang, Phys. Rev. Lett. 111, 027205 (2013). “Domain wall propagation through spin wave emission”, X. S. Wang, P. Yan, Y. H. Shen, G. E. W. Bauer, and X. R. Wang, Physical Rev. Lett. 109, 167209 (2012). “All-magnonic spin-transfer torque and domain wall propagation”, P. Yan, X. S. Wang, and X. R. Wang, Physical Rev. Lett. 107, 177207 (2011). “Comment on ``Interaction-induced shift of the cyclotron resonance of graphene using infrared spectroscopy”, W. Zhu, Q. W. Shi, J. G. Hou, and X. R. Wang, Phys. Rev. Lett. 105, 159703 (2010). “Inverse Square-Root Field Dependence of Conductivity in Organic Field-Effect Transistors”, J. H. Wei, Y. L. Gao, and X. R. Wang, Appl. Phys. Lett. 94, 073301 (2009). “Theoretical limit in the magnetization reversal of Stoner particles”, X. R. Wang and Z. Z. Sun, Phys. Rev. Lett. 98, 077201 (2007). “Proximity and anomalous field-effect characteristics in double-wall carbon nanotubes”, Jie Lu, L. M. Peng, Sun Yin, Z. Z. Sun, and X. R. Wang, Appl. Phys. Lett. 90, 052109 (2007). “Theoretical limit of the minimal magnetization switching and the optimal field pulse for Stoner particles”, Z. Z. Sun and X. R. Wang, Phys. Rev. Lett. 97, 077205 (2006). “A metallic phase in quantum Hall systems due to inter-Landau-band mixing”, G. Xiong, S. D. Wang, Q. Niu, D. C. Tian and X.R. Wang, Phys. Rev. Lett. 87, 216802 (2001).